Like many of you, I’m a horsewoman on a strict budget. 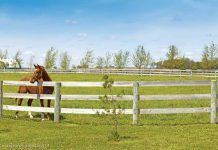 The needs of my two boys, Wally and Danny, come first, and with hay prices running about twenty dollars a bale that means there’s little left over for me to spend on a whim. The “play money” I somehow manage to accumulate comes from judging horse shows, but the yucky weather out here just won’t go away. The last three shows I was contracted to judge got rained out, which frustrates me to no end. Why? Because, gosh dang it, Mama needs a new pair of boots! And right now all I can do is troll the aisles of the neighborhood boot store and drool. The soft leather on these boots is brushed with metallic gold. I’m guessing they aren’t designed for mucking stalls or bathing horses. While I’ve always been a cowgirl at heart, I rode hunters and jumpers for decades before crossing over to primarily riding western. So initially my taste in western wear was pretty unsophisticated. That was especially true when it came to boots. I was used to low-heeled, knee-high English field boots that were available in a wide range of colors, all of them black. When I shopped for my first pair of western boots I was overwhelmed with a sense of culture shock. So many colors! So many styles! Such elaborate embroidery! I was also struck by how many members of the animal kingdom were represented on the shelves. Apparently a great deal of creativity, not to mention hunting skills, goes into making a pair of western boots. How far does one have to venture to procure the hide of a water buffalo? And what enterprising genius looked at an ostrich and thought, “Yup. I’ll bet that bird’s skin would make a cool pair of boots”? To this day I’m also conflicted about wearing my jeans over my boots. I realize that’s the tradition, except for the taller buckaroo-styled boots, but I can’t come to terms with it. Instinctively I grab boots whose tops are lavishly decorated with curlicues and emblems of stars and flowers. But then all that garish beauty ends up shrouded by the cuffs of my dusty jeans. That makes me wonder: Why do boot makers embellish the tops with fancy designs and doo-dads if no one’s going to see it? I once asked a boot store clerk that very question and she said something like, “Well, you know what you’re wearing, and that’s what’s important,” and, “Someone will see the fancy details when you’re putting them on or taking them off.” Really? That’s your best argument? Because those are the same reasons clerks use to convince me to buy expensive lingerie. Finally! A pair of boots designed to be worn outside my jeans! Unfortunately, I look more like a pirate than a cowgirl. Oh well. Until the weather settles down and horse shows get in to full swing, I won’t be buying any new boots. I’ll just continue to haunt the boot store, caressing the exotic skins of expensive boots and tracing my fingers along the curlicues of intricate stitch work. Eventually I will have tried on every pair in my size, which ought to make the act of actually buying a pair easy. Or so you’d think. I know what you mean. I got a pair of western boots for when I just do groundwork so I don’t mess up my english stuff hehe. But there are so many choices! And my friend would love those blue boots. A girl at my school has those blue boots! They’re gorgeous! As a little girl I fell in love with cowboy boots. I wore my first pair until my mom had to duct tape them up because any kind of proffesional repairs just wouldn’t work any more. One night she snuck into my room and threw them away, but replaced them with a brand new pair that I could actually wear to school. OH MY GOSH! I could not relate more. I must be the only horseless horse-crazy girl, but I have cowgirl hats, western shirts, but it took SO LONG to find a pair of boots under $100. 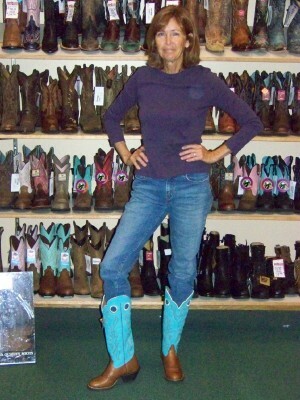 I actually tried on those blue boots and loved them but they were crazy expensive at Sheplers, the only (sob!) Western store I have every been too. But other than those boots, they have awesome deals. Shop there if there is one near you! I have those same Boots! I even wore them to a show with my flat hat and ranch saddle. Did pretty good that day.